Apple and Google give pretty flakey states on their respective ecosystems (though Google is far worse), but both have given numbers for total (i.e. 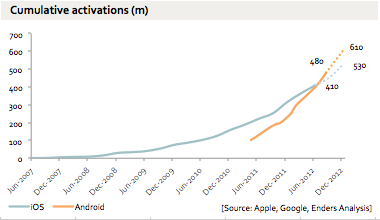 cumulative) sold/activated devices on a fairly regular basis. The most recent were 410m iOS devices (June 2012) and 480m Android ‘install base’ (September 5 2012). I’ve plotted these together with past announcements on the chart below. Android has now clearly overtaken iOS. If I then apply my estimates for sales in the rest of 2012 (the dotted lines) we see that the two ecosystems combined will get to around 1.1bn cumulative devices sold by the end of the year. Of course, not all of these are still in use (though given the rapid ramp up of Android most of those are). If we take a rough rule of thumb that only devices sold in the last 24 months are still active, this would give an active base of 370m iOS devices and 550m Android devices, for a total of, say, 920m active devices.